Addis Ababa February 10/2016 The government of Sweden is interested to further strengthen all rounded cooperation with Ethiopia, according to the country’s Ambassador to Ethiopia. 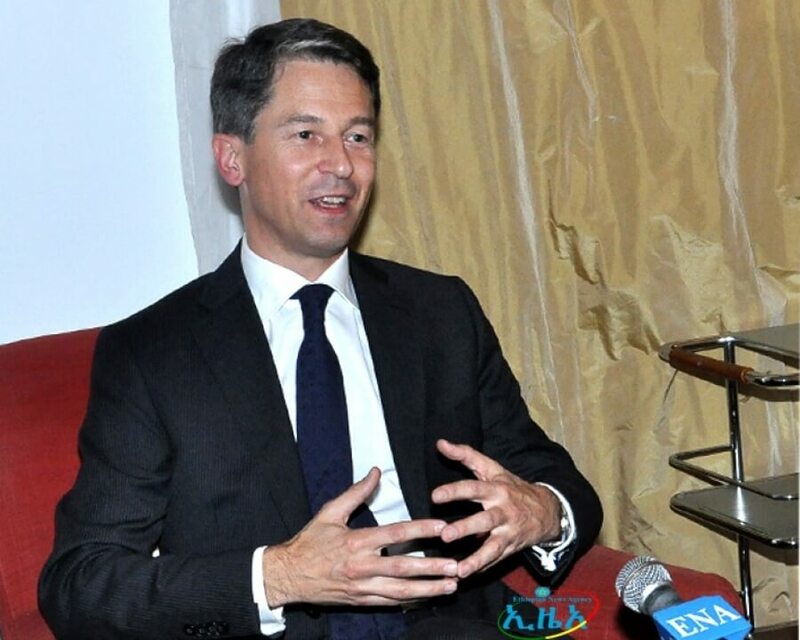 In an exclusive interview with ENA, Swedish Ambassador to Ethiopia Jan Sadek said Sweden has had a lot of development cooperation with Ethiopia in which it is interested to further enhance. The two countries have a good historical relationship which extended to building modern and new partnership, according to Ambassador Sadek. He mentioned his country’s active engagement in building 6,000 schools in Ethiopia in addition to a clinic and the country is now highly engaged in private sector development. “We are now mainly looking into partnership with Ethiopia while we can discuss not only Ethio-Sweden, but also global issues like climate change, migration, peace and security in the region” he said. Ethiopia’s efforts in the agendas of climate change are very strong which earned the country global support and admiration in which Sweden stands alongside of efforts by Ethiopia, Ambassador Sadek stated. “The Swedish government will adopt development strategy that it hopes to be able to assist Ethiopia in its own climate and environmental ambitions,” he added. Sweden is among the countries pledged to support Ethiopia in realizing the Climate Resilient Green Economy strategy (CRGE) in the coming years. Alongside such fruitful partnerships, the government of Sweden is also looking into the business side of establishing cooperation with Ethiopia by attracting Swedish investors to Ethiopia. The ambassador also said it is very important that Ethiopia is entering into the stage of industrialization. In this regard the Swedish embassy in Addis Ababa is making efforts to bring more Swedish investors to the country. Swedish clothing retail company H and M has started out source in Ethiopia, the Ambassador explained, further speaking of its huge significance in increasing bilateral exchanges between the two nations. H and M decided to come to Ethiopia as one of the first country in Africa to look for new production market, he said, indicating signs of joy from different corners over the company’s engagement in Ethiopia. Many of Swedish investors come to Ethiopia as high tech companies like Ericsson and H and M. They added values in the process of knowledge transfer to their respective Ethiopian staff, he claimed. SKF, Scania and Volvo are also among the Swedish companies with strong presence in Ethiopia. Ethio telecom decided to give contract to the Swedish mobile network company Ericsson to provide mobile network in sectors of southern Ethiopia. This is a huge contract and is remarkable achievement, he noted. “Last year, because of the success of the Swedish mobile network company Erickson, we had a total export of 600 million USD and Ethiopian export to Sweden is also increasing which is equally good,” Sadek said. Swedish export to Ethiopia circle around 30 million USD every year. The ambassador observed the impressive growth Ethiopia had over the past ten years, from which, he said construction sites, industrial zones and factories are the major forces to the Ethiopian economy. On the other hand, Sweden is a candidate for the United Nation Security Council (UNSS) in 2017/18 which also happens to be on the same year as Ethiopia’s membership to UNSS. He noted that Sweden and Ethiopia could join the council on the same time and make joint effort to enhance peace and security globally as well as in the Horn of Africa region. According to official documents, Ethiopia and Sweden established their diplomatic relation in 1954.